Latest Shop News From Designer Maker Rachel Lucie – Tagged "green"
William Morris flower designs, the Arts and Crafts movement and other floral art through the ages is making a comeback with flower prints being big news in fashion with tea-dresses and maxi-dresses this season. This summer I've really been taking inspiration from my love of botanical drawings and the role that flowers have had in design through history. My Botanica Jewellery Collection, reflects this year's floral trends with the Flower Garden necklace and bracelet, and Daisy Chain bracelet and earrings. Forget me Not necklace and earrings are an amazing blue which seems amplified by the blue of blue lace agate when paired with tiny sparkling iolite beads. The loose charm-style design is carefree and would go wonderfully with a linen dress, or a vest and jeans. From a gesture of love, to bringing nature inside my home with floral decor. For sheer colour, elegance and femininity, flowers will always inspire me. You can check out the other handmade jewellery designs in my Botanica Collection. I've just added the handmade silver Walk in the Woods Earrings to my Inspired Collection today. They compliment the Walk in the Woods Bracelet, also inspired by the many greens of nature. I combined verdigris-coloured copper turquoise with mossy green garnets offset by oxidized silver and I had to choose which of the many green stones I should use from the bracelet, it wasn't easy! Both these stones are unusual, another reason for choosing them for this design. The grossular green garnets are so glossy, contrasting beautifully with the matt-finish on the veined copper turquoise. 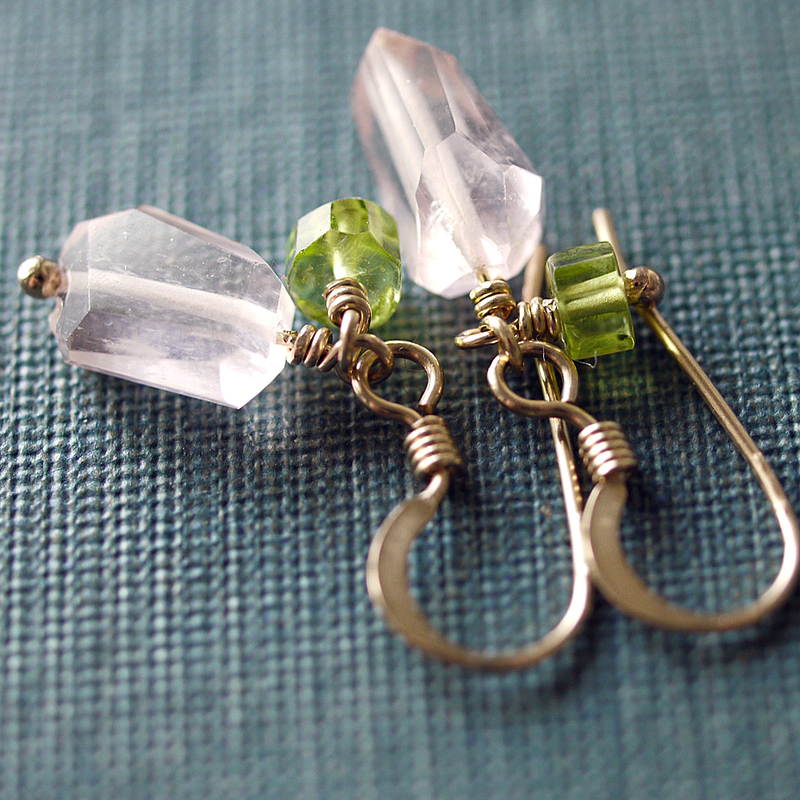 If you're a lover of greens, like me, you'll find these are a very versatile pair of earrings. Here's Rosa from my Luxe Collection. 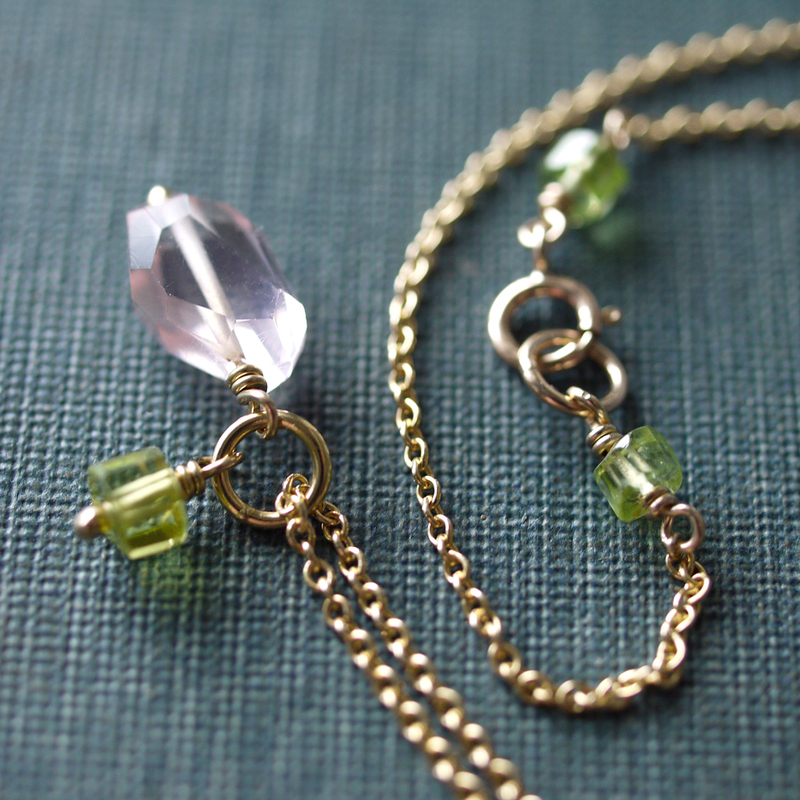 I've used faceted nuggets of rose quartz with tiny peridot hexagons on gold-filled accessories. They make a very feminine and light combination.